Exciting News from the American Eagle Foundation! 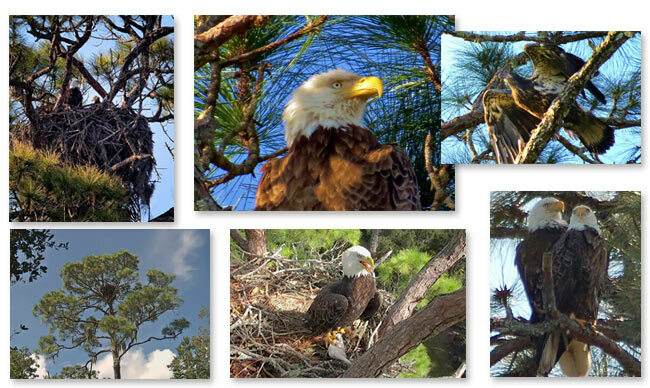 Beginning October 1, 2013, the AEF will be video streaming a wild Bald Eagle nest live from Northeast Florida. The stars of this new virtual reality show are Romeo and Juliet – a pair of Bald Eagles that have been occupants of their huge nest for many years. 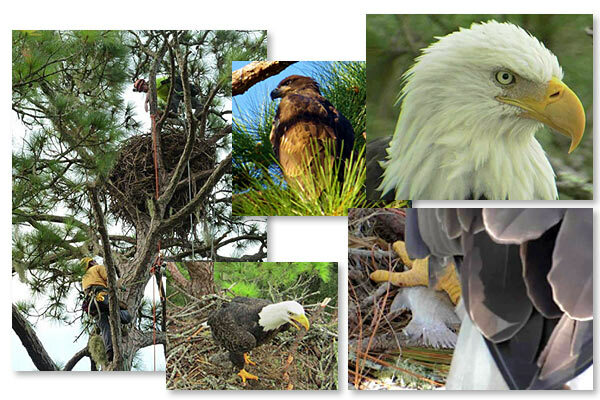 The nest can be seen in the photos below, and you can access links to a page with more information, as well as links to the video streams, by going to our website, WWW.EAGLES.ORG. 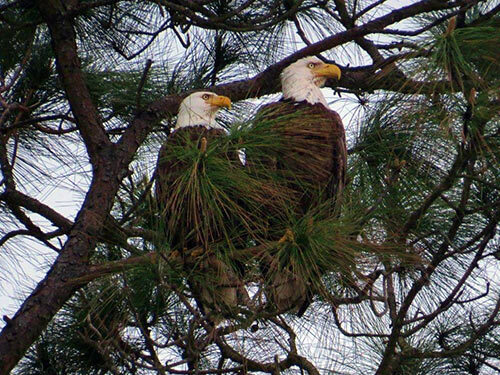 For the past 5 years, careful and meticulous documentation has been made regarding behaviors of this adult eagle pair, including the exact dates they return to the nest from their off-season travels, nest preparation, mating, egg laying, incubation, hatching, and the fledging of the eaglets. Some candid shots of our stars. The cam quality is amazing. Two high-definition video cameras have been installed to provide the best “up close and personal” viewing for the people who visit our website—without ever once disturbing the daily activities of the eagles or their babies. One camera is in the actual nesting tree, and can be zoomed in for intimate details. The other camera was installed in another tree (about 110 feet from the nest tree) to give a wide angle view of the entire nest tree canopy, allowing viewers to see the adult eagles fly in and out of the nest, the youngsters ‘wingerizing’ and taking their first flights, and attempting their initial landings. The video cam channels, along with a Chat feature, can be accessed by following the links from our website, WWW.EAGLES.ORG. When viewing our live HD cams, it seems you are right there with the eagles! What better way for our viewers – adults and children – to learn about and appreciate the USA’s amazing National Symbol, the Bald Eagle! We invite you to visit our camera channels often, and share with your friends. We also ask that you help support the efforts of the American Eagle Foundation and this cam project by becoming a member. There are many levels of membership available, so you can choose the one that suits you best. You can also make a donation directly to the American Eagle Foundation. 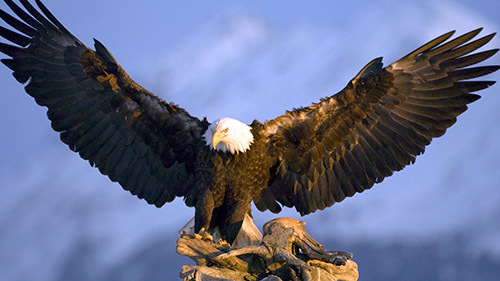 As always, we appreciate your support of the American Eagle Foundation, and its mission to protect the majestic Bald Eagle, the USA’s National Symbol, and its habitat by supporting and conducting eagle and environmental recovery and education programs. Please visit our website to learn more about what we do and how you can help.